Indian Almond Leaves: Keeping your fish happy, naturally. If you have been keeping fish for a while now, it’s highly likely you have heard of Indian almond leaves. These leaves are often referred to as a natural miracle. There are claims that Indian almond leaves are capable of bringing fish back from the brink of death, helping betta to spawn and even reduce stress in fish. Do Indian leaves live up to the hype? You’ll learn the answer to this question and more as I teach you everything you need to know about Indian almond leaves. Why are Indian almond leaves used in aquariums? Why do Indian almond leaves change the color of your water? 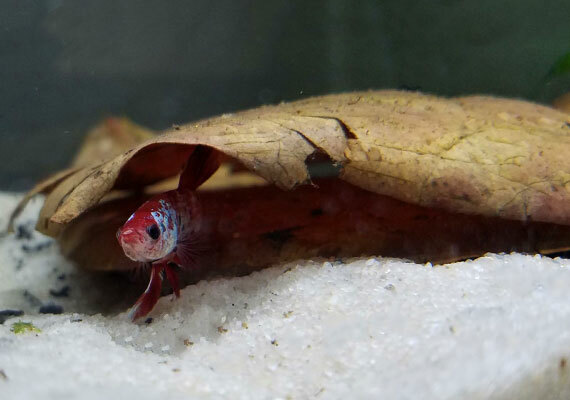 Why are Indian almond leaves recommended for betta tanks? Which fish don’t like Indian almond leaves? Why choose Indian almond leaves over another kind of leaf? How do you use Indian almond leaves? What if you use too many Indian almond leaves? What are the alternatives to Indian almond leaves? 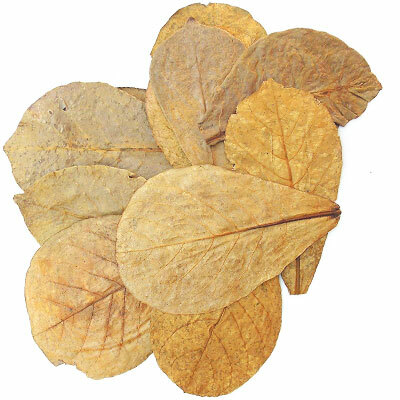 In aquarium use, Indian almond leaves refer to the dried leaves of the Terminalia catappa tree – a tree that is native to Southeast Asia and has been used in traditional medicine there for centuries. 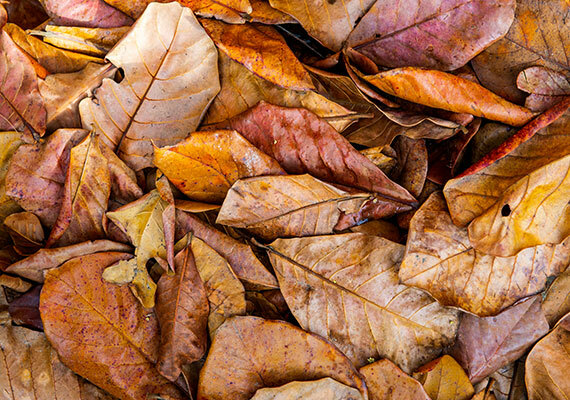 The leaves are usually harvested by picking them up off the ground. Once dried, they are ready to be used in aquariums. You might also hear Indian almond leaf shortened to IAL or referred to as catappa leaves, named after the tree it comes from. Let’s take a look at the 5 most common uses for Indian almond leaves. When added to your aquarium, an Indian almond leaf will gradually break down. And as it does, it releases tannic acid, tannins and other substances into your aquarium. As the tannic acid is released, it lowers the pH of your water. If you want a natural solution to reduce the pH levels in your aquarium, Indian almond leaf helps to achieve just that. A study has also found that Indian almond leaves can significantly decrease water hardness (GH), which can benefit those who use hard water in their aquariums. Okay, but what good is that for your aquarium? Well, the water out of your faucet probably doesn’t match the ideal conditions of the fish you keep. Indian almond leaves change the water so that it more closely resembles the habitat of your fish, particularly those from Southeast Asia and South America. Many aquarists swear by Indian almond leaf as a natural remedy for diseases or injury involving their fish’s skin or rather their scales. It is believed the tannins released by Indian almond leaves kill bacteria, fungus and viruses, allowing an injured fish to heal much quicker. It is even suggested that Indian almond leaf might be a better solution than antibiotics and other medications when fighting bacteria and fungus in commercial fish farms. 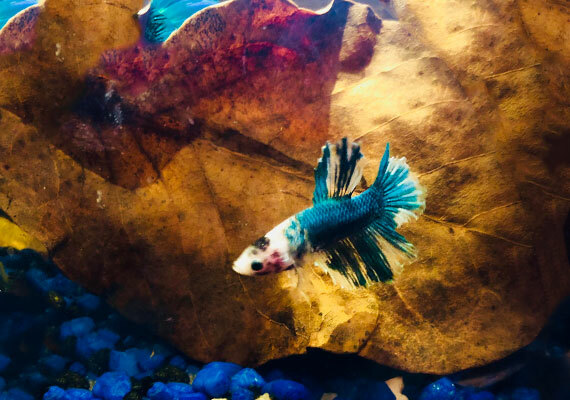 In Southeast Asia, many betta keepers add an Indian almond leaf to their betta’s water because they believe that it toughens their fish’s skin and makes them better for fighting. They also use it to help a fish heal after a fight. While there have been no studies that prove Indian almond leaf helps toughen betta skin, there is strong anecdotal evidence to suggest it does. You see, Indian almond leaves contain flavonoids. I won’t bore you with all the details, but a flavonoid is essentially what gives fruits and vegetables their color. But it’s one flavonoid in particular that we are interested in – quercetin. And, Indian almond leaves have lots of it. Quercetin has been shown to offer anti-inflammatory benefits to humans. Other studies show that tannins have anti-fungal properties. It’s possible the tannins and flavonoids in Indian almond leaves are responsible for fish healing faster. Many fish release their eggs (spawn) on or underneath fallen leaves. This helps hide eggs from predators or from washing away. Discus and tetras prefer to spawn on leaves at the bottom of a waterway. Betta and gouramis, on the other hand, build bubble nests on leaves that float on the surface. Indian almond leaves also have another benefit to spawning, and it’s one I covered earlier. Many fish will only spawn under certain water conditions. And the reduced pH and water hardness may be exactly what is needed to trigger your fish to spawn. 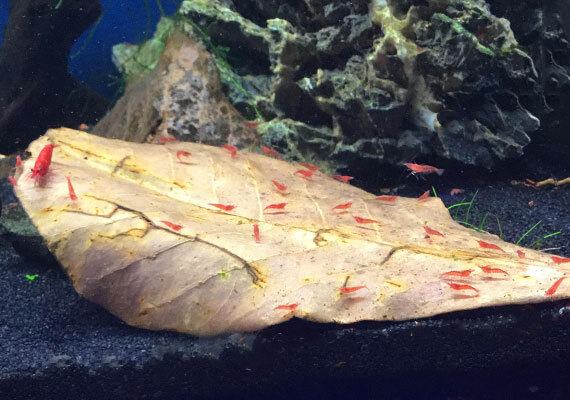 Indian almond leaves are the gift that keeps giving, even once your fish have hatched. Many fish keepers add Indian almond leaves to fry tanks – an aquarium that is set aside just for baby fish. First, the leaves give fry a place to hide, allowing them to feel safe. Sure, there are no predators in your fry tank, but your tiny fish don’t know that. As the Indian almond leaves begin to break down, microorganisms called infusoria appear and feed on the leaf. Infusoria are so small that humans can barely see them with our naked eye. However, to your fry that are barely bigger than an eyelash, infusoria might as well be a steak dinner. Newly hatched fry happily chow down on infusoria until they grow large enough that they need to switch to an alternate food source. Shrimp loooove Indian almond leaves. They often swarm any new leaf that is placed in their tank. Well, shrimp love the taste. Your shrimp will happily munch on Indian almond leaves and the microorganisms that grow on them as they break down. 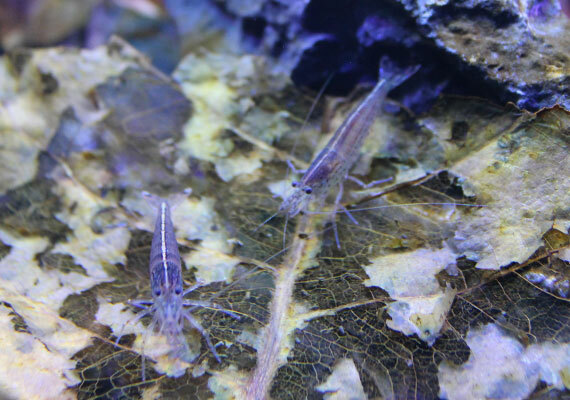 Shrimp also happily hide underneath the leaves once they are full. Dinner and a home? It doesn’t get much better than that! Important: Some species of shrimp prefer high pH and water hardness. Indian almond leaves are not suitable for these shrimp. As Indian almond leaves break down, they release tannins. These tannins can stain your water, turning it a yellow or brown tinge. It’s similar to dipping a tea bag into a hot cup of water. The tannins are released into the water, giving the tea its color. To a beginner, this yellow water can be quite a surprise. I mean, whenever you go to a fish store or aquarium, the water is crystal clear, right? Well, it might surprise you to learn that this yellow water is actually a good thing for many types of fish. You see, lots of fish come from waters that are a murky brown color. Most rivers and streams are a dark color because thousands or even millions of leaves have washed into the water and broken down. While you might not be crazy about the color, this darker water may reduce stress in shy fish like discus. And since stress is the number one cause of death in fish, a little bit of yellow water is a small price to pay for the happiness of your fish. Activated carbon will do all the hard work for you. Depending on how much you use, activated carbon will either reduce the yellowness or clear it up altogether. Be mindful that activated carbon will continue to absorb tannins until it is ‘full.’ When this happens, it needs to be replaced. It is for this reason that I recommend buying a bottle of activated carbon like this one and using a filter media bag to hold it together. It’s much cheaper than constantly buying disposable filter cartridges. Please note that completely removing the tannins will also stop Indian almond leaves from lowering your pH levels. If you want to keep the good stuff, a partial water change will help lighten your aquarium. The clear, fresh water will dilute the yellowness. Bettas are native to Laos, Cambodia, Thailand and Vietnam. 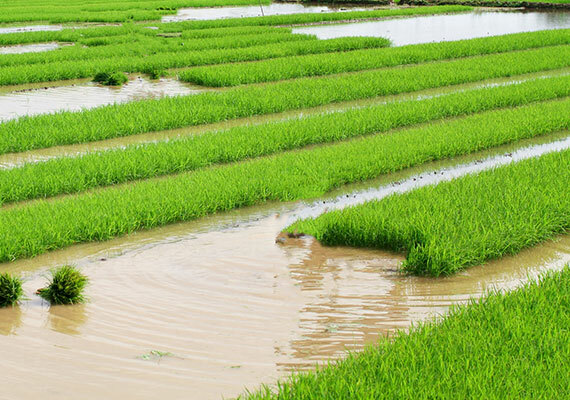 Their natural environment is slow-moving shallow water – like marshes or rice paddies. You see that water? Not exactly clear, is it? Habitats like these are referred to as blackwater – water that has turned dark due to decomposing leaf litter. Blackwater habitats are typically acidic with very low water hardness. Indian almond leaves help your water mimic these conditions – making your betta feel right at home in your aquarium. Bettas are commonly kept in smaller aquariums (even though they shouldn’t be!) – often by beginners who don’t know any better. Because these small tanks can quickly turn unhealthy, the antifungal and antimicrobial properties of Indian almond leaves can help prevent diseases like fin rot. Indian almond leaves also play a vital role in breeding bettas. Because Indian almond leaves are broad, float well and don’t fall apart easily, they make a good starting point for a bubble nest. 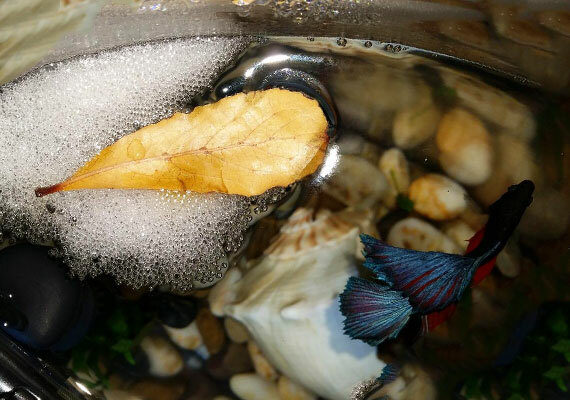 The bubble nest underneath the leaf will prevent it from sinking even once it has soaked through. If you have bred fish before, you know that fish eggs are notorious for developing Saprolegnia, a type of mold that grows under water. 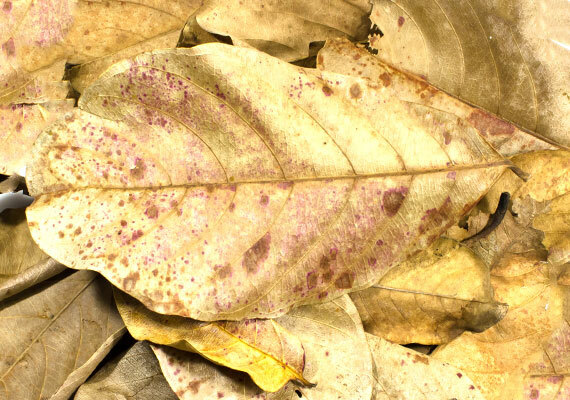 The antifungal properties of Indian almond leaves prevent this from happening. Finally, once the baby bettas hatch, the infusoria that grow on the decaying leaf will be their first food. As you see, Indian almond leaves play an important role in keeping your betta fish healthy, no matter how old he may be. Some owners even use a clip, like this one, to make an Indian almond leaf into a natural betta hammock. 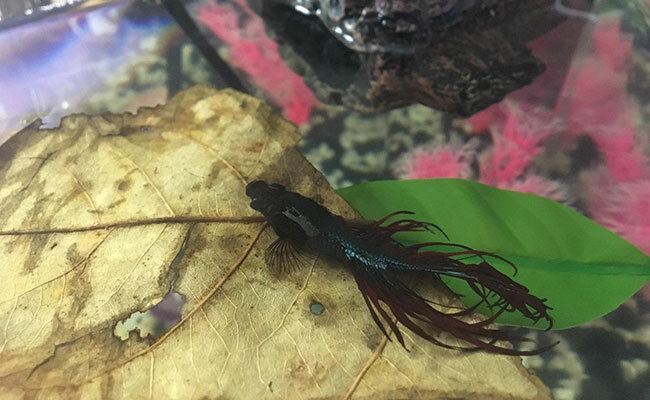 Check it out – a betta sleeping on his own leafy mattress! If your fish love high pH or hard water, Indian almond leaves are not suitable for your tank. This includes most species of African cichlids – fish that are naturally found in more alkaline waters with a high hardness. Well, Indian almond leaves are unique in that they break down slower than other leaves. The leaves have big, tough veins that take a long time to deteriorate, long after the rest of the leaf has broken down. The advantage to this is that you can pull the leaf out of your aquarium without it disintegrating into small pieces. Also, while other leaves might give off tannins, Indian almond leaves also have medicinal properties – something that other leaves don’t offer. Important: Never place unknown leaves you find in your yard inside your aquarium. 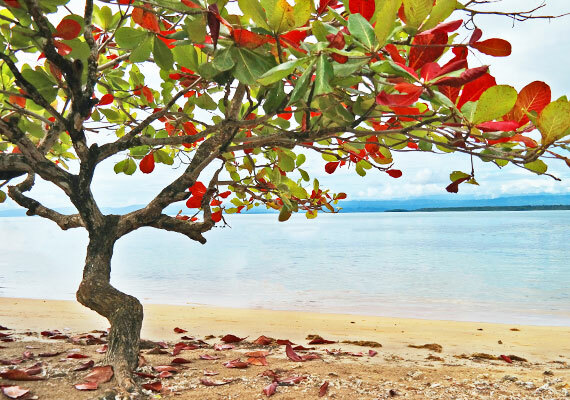 Not all tree leaves are aquarium-safe and may harm your fish. So, you want to add Indian almond leaves to your aquarium? The first thing you want to do is buy some Indian almond leaves. I find these or these to be the most consistent in quality. I have used both and happily recommend them. However, if you are on a tight budget, then you can try these. The most common way of using Indian almond leaves is to drop them directly into your tank. It’s generally recommended that you start with one medium-sized leaf for every 10 gallons of water inside your aquarium. But before you do this, remove any activated carbon or Purigen from your filter. These two filter media will remove the tannins that Indian almond leaves give off, removing its benefits – it’s like running your AC with your windows and doors open. Next, rinse the Indian almond leaf in fresh water to remove any leftover dirt or dust that may have been missed. Now all that’s left to do is drop the leaves in your aquarium. When you first add an Indian almond leaf to your tank, it will float on the surface. After a few days, it will waterlog and sink. Want the Indian almond leaf to sink sooner? Weigh it down with a rock or some gravel. As for replacing, you can do so whenever you choose. It’s fine to let the leaves break down completely and remove the leftover veins – this can take up to two months. If you have a smaller tank, you might find a single leaf is too much for your aquarium. You can either break the leaf in half or soak it in water for a few days. Pre-soaking Indian almond leaves in fresh water (use a water conditioner!) will release some of the tannins, resulting in a weaker effect when you place it in your aquarium. The trick is to soak, not boil, your Indian almond leaf. Boiling can release the majority of the tannins, making the leaves less effective. If it’s your first time using Indian almond leaves, make sure to monitor your aquarium water with an aquarium test kit to see how they react with your tank. Maybe you don’t want to add Indian almond leaves to your tank because it clashes with your decor. Or maybe you just think they look ugly. Whatever the reason, you will be pleased to know that you can receive the benefits of Indian almond leaves without actually adding them to your aquarium. Make an Indian almond extract. Simply boil about 2 quarts (2 liters) of water, place a medium-to-large Indian almond leaf in a clean jar and pour the hot water over it. Let it stand overnight before removing the leaf. The liquid in the jar should be a dark brown color. You may notice small pieces of broken life floating in the jar – you can remove these with a sieve. Cover the jar and store the extract in your fridge – it should last for several months. Add this to your tank as needed. I suggest adding it every time you do a water change since freshwater dilutes the tannins in your tank. Add more or less according to your needs. The advantage of using an extract is that no leaves will continue to break down, which prevents additional yellowing of your water. The extract allows you to precisely control the amount of tannins in your tank. While making an extract is cheaper in the long run, it relies on being able to source high-quality Indian almond leaves. Note: If your water has a high general hardness (GH) and carbonate hardness (KH), Indian almond leaf will have less effect on your parameters. The high mineral content of the water has a buffering effect and will somewhat counteract the acids coming from the Indian almond leaf. If you live in an area where the water is so hard that you still feel soapy when you get out of the shower, you will see less change in your pH, GH and KH. But the antifungal and anti-inflammatory properties of Indian almond leaves still benefit your tank. What if I use too many Indian almond leaves? Did you add too many Indian almond leaves to your tank and now your pH is swinging like crazy? Simply perform a 25% water change and add activated carbon to your water. This will filter out the remaining tannins, returning your water to normal. I would be hesitant to do a larger water change than 25% – any more and you risk drastically altering your pH instantly, which can shock and kill your fish. Instead, you want to rely on activated carbon to gradually remove the tannins. Are there alternatives to Indian almond leaves? Not feeling Indian almond leaves? Use these instead. While the following alternatives may not have the same anecdotal medicinal benefits, they add tannins to your aquarium, soften the water and lower the pH. Also known as sphagnum moss, peat moss can be put in filter media bags and placed inside your filter, hidden from view. You can find organic, chemical-free peat moss in the garden section of your hardware store. However, know that this will make your aquarium cloudy for the next day or so. I prefer peat moss pellets, like these, which don’t cause the same mess. Alder cones look like mini pine cones. They come from the black alder tree that is native to Europe but is also grown in the United States. Alder cones are commonly used in shrimp tanks and for decoration. Buy them here. In aquarium use, driftwood refers to basically any piece of wood that is safe to use in your fish tank. Because of this, there is a wide variety to choose from. Some are tannin-leaching machines while others barely tint your water. Driftwood should be boiled prior to use. Examples include cholla wood, which is a popular driftwood for smaller aquariums, while spider wood is popular in larger tanks. Dried banana leaves are much less common than Indian almond leaves but are used in a similar manner – in shrimp and betta tanks. Grab them here. Who knew a dried leaf could provide so many different benefits to your aquarium? With careful use, you can use Indian almond leaves to recreate your fish’s natural habitat. Your fish will be happier for it! 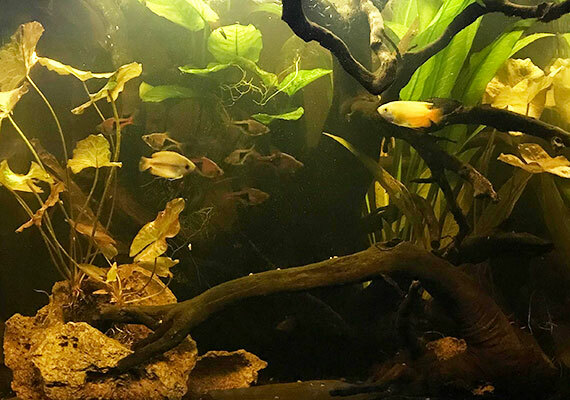 Do you use Indian almond leaves in your aquarium? Let me know in the comments below! This article was very informative, thank you! I do have one question though…I have a 10 gallon tank with one bug eyed goldfish. I use bottled water and always condition it first. His tank has no issues except a super high Ph. I know they like a 7.6 but his is off the color chart. Can I use an almond leaf for him? I don’t really want to use chemicals so I’m looking for an alternative. I also do frequent water changes but it still stays high. Can I ask why you don’t use tap water? 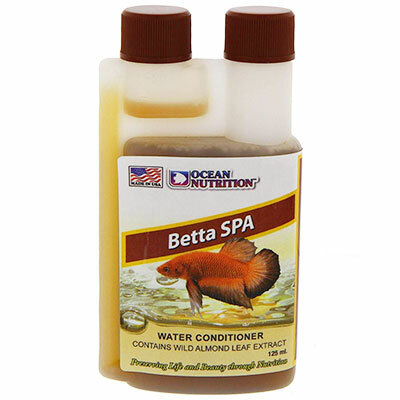 conditioned tap water is normally all that is needed for betta. Also, bottled water shouldn’t have a high pH that is off the chart. It would be like drinking ammonia otherwise. Are you sure your tests are working correctly? If the”off the chart” reading was accurate, your fish would probably already be dead. When I should remove the almond leaves ? How I use the Filter because more Oxygen effects to raise the ph. Any water you add to your tank should be dechlorinated. As for the aquarium salt, that’s unrelated to the IAL extract. It depends on what you are using it for. I just read your article and I find it very informative. I ordered some almond leaves and will begin to use them in my 125 gallon heckelii tank. The question I have is do I remove all carbon media for good? Excellent question! If you want to see the benefits of Indian almond leaves, and continue using them, then it’s recommended to skip the carbon. Activated carbon is a chemical media only removes bad smells, chlorine, medication and tannins(that the indian almond leaves give off). In an aclean, healthy tank, bad smells, chlorine and medication are not an issue anyway – carbon media isn’t essential to the functioning of a tank, although many brands would have you think otherwise. Quite in depth and convincing argument for the use of Almond leaves. My first ‘amazon’ tank (30 years back!) I attempted peat for that black-water aesthetic. I wasn’t impressed, and my wife was less so! I will probably try whole leaves, thanks for such a thorough article; I will be following your blog because it seems much more informative than most. Having used both, I probably wouldn’t use peat again either, it’s much more aggressive in it’s staining. Indian Almond Leaves are a little gentler in their approach. Thanks for the kind words, I would love to hear how your IAL experience goes in comparison! Juz read your blog. Nicely covered. I have a question. I saw some fungus(cotton like covering) like growth covering IALs in my tanks. Is it okey or shall i remove them. Is it white colored? This often happens when introducing things like driftwood, leaves and other botanicals. Take it out, wipe it away and place the leaves back in your tank. It generally goes away on it’s own, once it’s done feeding on whatever it wants. Look up images of “aquarium biofilm” if it looks like that, you have nothing to worry about – it’s normal! Unfortunately, this is only something you can tell yourself. Depending on the source and condition, some IAL contain more tannins than others. It’s trial and error. Unfortunately, without a test kit, it’s very difficult to determine what is happening in your tank. I just found your blog and website, and I have spent the last couple of hours reading your articles and studying your reviews. 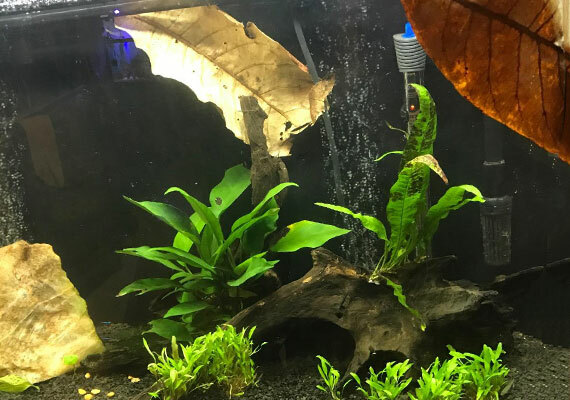 I am especially interested in the use of these Indian almond leaves to lower the ph a little in my 20 gallon community tank (tetras, Cory cats, silver hatches, and a few nerite snails & an Amano Shrimp), Thanks for all the information that you have shared. Your articles are so well-written and easy to follow. I wish I had had your resources 6 years ago when I started fishkeeping. I would love to hear your experience with IAL. It takes a little bit of trial and error to figure how much to add to your tank at first, but once you have got a handle on it, you pretty much just repeat the same “dosage” each time. Nice post, Ian I think you have covered the Indian Almond Leaf very well. I use them all the time, in fact, I recommend everyone should have some. Except as you pointed out for high pH fish. Shrimp it is essential. Thanks. Thanks for your feedback. I take it you use IAL in for shrimp? It certainly is an unusual leaf. I would love to see a study done to determine what the actual medical benefits are. Many leave of trees and shrubs have medicinal properties. I did a quick search for any academic articles but did not come across any. API make Pimafix, West Indian bay leaf (pimenta racemosa) will treat fish fungal infections. One of the best leave for medical benefit is the Australian Tea Tree (Melaleuca alternifolia) it too is used in API Melafix. For humans, I always have a bottle as it is antiseptic, antiviral and antifungal. I sent many years in Australia and got to know it well. Trees have developed these properties to protect their leaves. It’s funny how few academic articles there are related to the hobby. While it’s fun that there is so much still left to discover, it does leave a lot of mean a lot of information passed around is based on anecdotal evidence – which makes it easy for misinformation and myths to establish themselves. I had a look at your two suggestions. It doesn’t look like Australian tea tree is readily available for sale here in the United states, although you can buy the extract as an essential oil. West Indian Bay leaf is scarce and the few locations that did have it sold it at a higher price than Indian almond leaf. It looks like for the tannin + medicinal combo, indian almond leaf is the way to go here in the US..